Super Mouse Auto Clicker is a powerful yet easy-to-use Mouse Auto Clicker software. It can used to click your mouse at defined location on the screen automatically. Super Mouse Auto Clicker can help you refresh a web browser, open many instances of another program. Also it can be used in some games or anything else that you can think of that would require massive amounts of clicks. Super Mouse Auto Clicker also can simulator several mouse click in the same time. User-friendly: With many features that can free your hands and save your time. Current Point Clicker: Support click on the current point where the mouse point is. Fixed Point Clicker: Support click on fixed point,and define action after that,back to the original location or not. 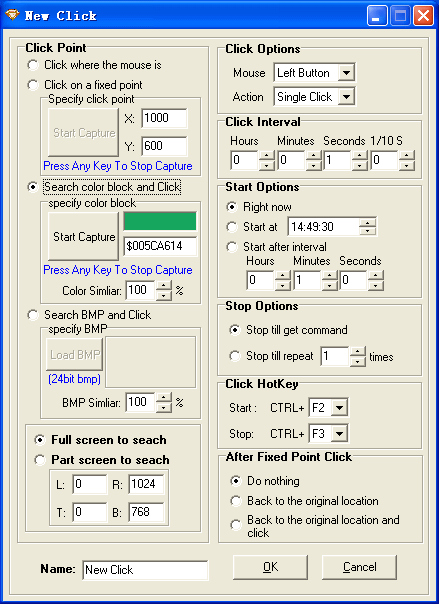 Color Clicker: Support click special color block on the screen. You can pick color and define what color to find with. Picture Clicker: Support click special BMP picture on the screen. The picture must be 24 bit BMP. Also you can define the scope on the screen where to search it. Multiple Click: It can simulator several mouse click in the same time. Auto Start: It can set to Auto start to run when the program start. Hotkey Start & Stop: It can be started or stopped by hotkey .